The U.S. embargo on food and medicine exports to Cuba are, in my opinion, critical to the Castro government’s ability to manipulate internal and international public opinion by placing the blame for Cuba’s grave problems on external factors. It is also key to understanding the bitter international outcry against the Cuba policy of the United States, which lends a certain legitimacy to the Castro government and shields it from stronger demands for a democratic rule of law in Cuba. Four foundations4 provided the funding for the report. To my knowledge, at least three have committed considerable efforts to oppose the embargo and foster engagement and exchanges with Cuba. The dedication of resources and the credentials of many of the individuals involved seem unquestionable. Regrettably, I found the end result to fall way short of its purported goal—which is, as expressly stated, to “assess whether the U.S. embargo jeopardizes the health of the Cuban population.” This is due to serious methodological faults which inevitably taint its findings and severely weaken its overall credibility. The report amasses considerable data on selected aspects of health and nutrition on the island—in particular the lacks and limitations currently endured by the Cuban population—and exposes many examples of the embargo’s actual or/and alleged costs to Cuba. But I was left with the impression that, more than anything else, it merely adds to the prevailing tendency to confuse fact with myth instead of helping to uncover the truths surrounding this issue. In fact, by failing to offer solid and reliable evidence on what exactly the actual cost of the embargo is or might be in the overall context of health and nutrition, it altogether misses its pivotal objective. Consequently, it wastes a golden opportunity to put talented brains and substantial financial resources to work for a goal which I believe is ultimately well-intentioned. We are left to speculate whether overzealous opposition to the sanctions on food and medicines on the part of the authors, collaborators, and supporters of the report might have prevailed over reason, objectivity, critical analysis and, perhaps, even academic integrity. Conceivably, a lack of skills on the part of the authors in specific areas such as economic analysis, inadequate research, improper historical focus, gullibility, language and cultural obstacles, or a combination of all of the above, could explain the report’s startling flaws. Or, maybe, in essence or in part, there was a greater need to dismiss, ignore or diminish the failures of Cuba’s socio-political and economic model, in response to biases— intentional or not—on which we would not even speculate to avoid being unfair or simply wrong. In the end, whatever the reasons, all of which matter less than the noble goal I believe we all seek in advancing Cuba’s interests, the report, I fear, does an injustice to the truth. As a result, it weakens the very cause it advances of ending the embargo on food and medical products. And, more importantly, it does a disservice to the people of Cuba—those who most concern the authors and collaborators of the report and, I believe, everyone who shares a commitment to the well-being of the Cuban people. After a year-long investigation, the American Association of World Health has determined that the U.S. embargo of Cuba has dramatically harmed the health and nutrition of large numbers of ordinary Cuban citizens. … It is our expert medical opinion that the U.S. embargo has caused a significant rise in the suffering—and even deaths—in Cuba. … A humanitarian catastrophe has been averted only because the Cuban government has maintained a high level of budgetary support for a health care system designed to deliver primary and preventive health care to all of its citizens. Cuba still has an infant mortality rate half that of the city of Washington, D.C. … The U.S. embargo … has wreaked havoc with the island’s model primary health care system. The crisis has been compounded by the country’s generally weak economic resources and by the loss of trade with the Soviet bloc. Repeated references to the achievements of Cuba’s health care system appear, first, in an historical vacuum. In addition, the uncritically favorable depiction of healthcare in particular, contrasts with many reports of independent sources in Cuba and many testimonials which I have personally witnessed over the years. Take, for example, a Cuban Communist Party confidential report prepared in 1988 (notice it was prepared before the elimination of Soviet assistance) to assess the quality of health care in the province of Holguín.5 According to the report, 87.6% of the 10,756 opinions surveyed were unfavorable—this, taking into account that fear is endemic to totalitarian regimes and is likely to have influenced the degree of candor of respondents. This detailed survey documents all sorts of outrageous complaints regarding the behavior, availability, and qualifications of health care professionals, deplorable conditions in health care facilities, especially in emergency rooms, mistreatment of patients, delays of up to four months in obtaining appointments with specialists, lack of basic medical supplies such as X-rays required for surgeries, contamination in operating rooms, lack of water, prescription of medications unavailable in pharmacies (this, before the Cuban Democracy Act was passed banning subsidiary sales), personal use of ambulances and facilities by health care workers, etc. 1. The entire report provides no account nor research of alternative sources or opinions other than official government sources or international institutional sources which validate the overall conclusion that the embargo is to blame for any of the issues addressed in each section. Despite an impressive list of visits to patient care facilities and institutions and 170 interviews, not one was conducted with Cuban professionals not employed by state-controlled institutions. No effort seems to have been made to contact nor interview people who have left the state establishment or who live in exile. Yet, there is an ample supply of professionals, both in Cuba and in the United States, with a wealth of experience and knowledge of the fields of health and nutrition not dependent on state employment. Growing internet resources, reports of independent journalists in Cuba, dissident medical professionals in Cuba, recent émigrés/exiles, and defectors, point to the easy availability of these sources. Furthermore, it is not clear which interviews and visits were conducted by the two authors and which were conducted by the 9-person delegation which paid a seven day visit to Cuba in October of 1996. It is also unknown if members of the delegation and/or the authors speak fluent Spanish and if Cuban interpreters were used. We do not have time here to detail the many deficiencies in the delivery of health and nutrition in Cuba which have nothing to do with external factors and the report failed to identify. Any analyst with some superficial interest in looking into these topics would easily find information about them. The report leaves the causes of Cuba’s economic problems virtually unexplored despite the obvious repercussions these have on health and nutrition. The following statement illustrates the report’s simplistic explanation of Cuba’s economic collapse: “The U.S. embargo has seriously impeded Cuba’s ability to find substitute markets and sources of essential goods and has severely limited access to financing and commercial credit, critical for recovery.” The section “Roots and Extent of Cuba’s Current Economic Crisis” is a mere seven short paragraphs—two pages long—of a 302-page long report (excluding Appendices). This section essentially summarizes Cuba’s loss of trading relationships with the Soviet bloc and the elimination of the oil-for-sugar barter agreement with the Soviet Union. There is no mention of Soviet subsidies7 nor of Cuba’s evident economic decline before the end of massive Soviet assistance. A four-paragraph section on foreign debt merely provides an itemization of Cuba’s external hard currency debt and refers to recent debt-equity swaps (a mechanism to reduce the debt). The Cuban government arguments uncritically repeated, as is standard practice in most of the report. Let me quote: “The Cuban government argues that external factors, principally the 35-year U.S. trade embargo, are largely to blame for the country’s debt problems, including the fact that Cuba canceled principal and interest payments in 1986 and broke off formal talks with creditors three years later.” The export fails to address the reasons behind Cuba’s default on its external debt in 1986, several years before the dissolution of the Soviet bloc and the elimination of Soviet aid. Plus, the issue of how, with the embargo in place, Cuba gained access to billions of dollars in external credits— namely from Western banks—is not mentioned. In addition, there is nothing on how Cuba used this large inflow of capital, not to mention additional billions it now owes the former Soviet Union, China, Vietnam and North Korea. In contrast to the two pages devoted to the causes of the economic crisis, four-plus pages are devoted to Cuba’s “Recovery Plan.” No analyses or critique are provided of the adequacy or inadequacy of Cuba’s limited reforms, which many specialists describe as grossly insufficient. Again, the embargo is blamed for the island’s hard currency shortfalls—for denying credits to Cuba. There is no mention that Cuba indeed has access to international credit markets for financing, but, due to its undeniable lack of creditworthiness, is only able to obtain short-term loans at very high rates and mostly with export receivables as collateral. 2. A second important methodological fault: Despite consistent problems with statistics reported by Cuba, there are no caveats on the reliability of data and information furnished by Cuban authorities, on which the report relies almost solely. Time and time again, the verbatim assertions of interviewees are cited as evidence, without any reference to efforts to corroborate their veracity or put them into any type of context. Let me cite just one example. On page 112 of the report we find a table which illustrates one of the few efforts to provide a price comparison of the costs to Cuba of importing active ingredients for pharmaceuticals from European countries instead of from the United States. This reflects costs for Cuba as being 40% higher than if these inputs were purchased from a company in Miami—Tilgrex International Export, Inc. The cost of import was provided by MEDICUBA for purchases from European countries and comparative prices were then quoted, presumably by the authors, from the aforementioned company in Miami. 9 The following—which seem crucial to determining if this jeopardizes or not the health of the Cuban population—is left unexplained: a) How much would this added cost, for a seemingly large volume of active ingredients, raise the cost of the finished product? ; b) What is the net cost of the embargo on Cuba’s growing pharmaceutical export industry, reported to have exported US$125 million in 1996? ; c) Was the information provided by Cuba corroborated by quoting the price of the active ingredients on the open market? ; d) Are these active ingredients available from other countries—say Latin American countries active in the pharmaceutical market, such as Mexico, Venezuela, Colombia, Chile or Brazil – from where the cost of shipping would be lower? And if so, at what cost? 3. A third fault, which I have already referred to, is the lack of the simplest critical analysis, a failure to dig deeper—this in respect to even uncomplicated issues. Let me illustrate this with respect to just the simple issue of access to medicines and medical products. The report basically states that current licensing procedures in effect block sale of medicine from the United States, which is allowed under current laws with a license from the Office of Foreign Assets Control (OFAC) of the U.S. Treasury Department. As a result, Cuba allegedly has no access to U.S.-patented medicines or is forced to purchase medicines at higher prices in other countries. The key issue here, in my opinion, is to try to arrive at the actual cost of the embargo by taking a sample list of the medical products most in demand and compare their international prices in alternative markets vis-à-vis their U.S. prices. Then, the cost of shipping should be factored in, adding any extra costs the embargo might impose in this area. The report failed to provide such a list or any table of comparative costs. It was my personal experience, after having lived ten years in Latin America—mostly during the profound debt crisis of the eighties—that access of medicines not produced by the U.S. was never a problem. Both Venezuela and Chile, countries where I lived with young children, whom, on occasion, required common as well as more sophisticated medications, had readily available locally-produced prescription and non-prescription drugs and all sorts of medical products. Not one single medicine had to be imported from the U.S. by my family in ten years. And, the prices of the locally-produced products were considerably lower than U.S. equivalents in every single case I can recall. I further understand that U.S. government officials have in several occasions requested from Cuban authorities a list of products Cuba has stated it is unable to purchase either in third countries or from U.S. companies. In each occasion, a list was not forthcoming, 12 and is also unavailable in the report. Instead, examples of medicines either unavailable or more expensive are offered, but I have not had the chance to research each case. I have not found any evidence of unfulfilled orders by Cuban institutions to U.S. pharmaceutical companies and, furthermore, understand that many Cuban health professionals are not informed of the embargo exception for the licensed sale of medicine to Cuba.14 Many US. pharmaceutical company executives share this ignorance, partly due to never having received an order of purchase from Cuba. If Cuba were in such desperate need for medicines obtainable only from U.S. companies, why doesn’t it place orders of purchase? It has been widely reported that there is adequate supply of all types of medications generally unavailable to the average Cuban in dollar stores and in health facilities catering to hard currency paying patients—tourists, diplomats or foreign residents. The report altogether fail to mention this. In fact, with the same U.S. embargo in place, health tourism is a growing industry which generates considerable hard currency revenues for Cuba and offers very high standards, quality, and access to all sorts of medicines and medical supplies, all unavailable to the general population. Let me make just a few comments on the issue of nutrition. In regards to the cause of nutritional deficiencies, the report cites the Cuban government’s allegations15 in a superficial, two-page, exposition. Selected data are used to show that the domestic food industry experienced considerable growth in the period 1963-89 as a result of government priorities and that agricultural production experienced substantial growth in the 20-year period between 1969 and 1989 (Report, pp. 123-125). To explain the subsequent economic crisis and the declines in agriculture and food production, the report cites the reduction in hard currency for purchases abroad as well as the higher costs and inaccessibility imposed by the Cuban Democracy Act (CDA).16 This U.S. law is said to have affected purchases for food processing equipment, pesticides, fertilizers, animal feed and fuel. Even the country’s severe lack of fuel—amply available in world markets—is blamed on the U.S. embargo, allegedly for raising the cost of other required inputs, which diminishes the availability of hard currency to import oil (Report, p. 128). A short section follows on Cuba’s dedicated efforts to develop biotechnology to boost food supplies and many pages describe the effect of deteriorating nutrition in several areas related to health. According to the report, before the passage of the CDA, three fourths of Cuban imports from U.S. subsidiaries were food and medicines (Report, p. 283). The embargo, particularly since the passage of the CDA in 1992, is said to have cost the Cuban government $196.3 million from 1992 to 1994 in higher shipping costs and prices (Report, pp. 129, 122). It is not clear where this figure comes from, as several numbers provided for specific food imports do not add up to this total. In addition, Cuban government calculations are cited of an additional $8.3 million paid in chemicals used in agriculture in 1994 (Report, p. 127). With regard to higher shipping costs, the report cites Cuban economists (government employees, one might add) as having calculated that each U.S. ship replacing a European freighter would save $215,800 and $516,700 replacing an Asian freighter (Report, p. 12). These figures had been provided by Cuba’s Ministry of Foreign Relations in a letter sent to the United Nations’ General Secretary dated June 9, 1995 (Report, footnote 2, p. 135). No effort was seemingly made to corroborate these numbers and no comparison with cost for freighters from Latin American countries or Canada were provided. The U.S. State Department, in turn, has reported that shipping costs for Cuba are 2-3% higher due to the embargo.17 The report makes no reference of attempts to contact U.S. government representatives regarding this issue nor cites State Department estimates. Moreover, the report does not take into account the value of donations and assistance for food in assessing the potential cost of the embargo. More importantly, the causes of the pitiful state of nutrition and food supply of the Cuban population remain unexplored. There is an implicit assumption that any cost overruns created by the embargo are to blame for the critical situation of food security and nutrition in Cuba. 1. Demonstrate how, by 1986, Cuba was behind in production of all the selected fool staples when compared with other Latin American countries, including those of similar or lower population and or land mass. 2. Show the steep relative decline in rural population and in employment in agricultural production as well as the sharp drop in agricultural production/ yields much before 1989. I am personally aware of Castro’s involvement in offering and providing dedicated medical care in Cuba for the son of a right-wing Chilean politician, who suffered severe neurological effects from a near drowning experience.21 This incident took place during the time that Cuba was lobbying for the reestablishment of diplomatic relations with Chile, which soon followed. Please refer to the Appendix for a calculation which, given the pervasive unreliability of data provided by Cuba, may seem more an exercise in voodoo economics than anything else. It is a hypothetical calculation based on a number of arbitrary assumptions constructed on data provided mostly by Cuban authorities. I caution that it might be missing unknown factors which might impact each selected caption and might not reflect all the figures that should be or could be estimated or calculated. Nevertheless, instead of a loss, it reflects a considerable gain to Cuba from the embargo in the areas of health and nutrition. At the very least, it could provide for a focused debate and more extensive analysis of the particulars, which I have found to be seriously lacking in addressing this issue. 1. Lázaro Barredo Medina, “Es imaginario el bloqueo de medicinas?,” Trabajadores (16 de mayo de 1997). This article was faxed to the author by the Cuban Interest Section in Washington, first quarter 1998. 2. Rough estimate – no data have been found to indicate there is an additional cost of other medical imports. 3. This calculation assumes that health professionals generated 50% of the $18 million reported by Cuba, minus 10% in costs. At the end of 1997 there were 2,808 Cubans working in more than 80 countries (34 countries of the Americas, 21 African countries, 14 European countries and 13 Asian countries). In 1997 Cuba reported to have received revenues of US$18 million for the export of services via professionals and technicians. “Exportación del trabajo produce $18 millones,” El Nuevo Herald (March 5, 1998) in Cuba- Net News. The U.S.-Cuba Trade and Economic Council, citing Cuban Minister of Foreign Investment reported that many of these 18,000 workers are said to be health professionals. “Doctors from Cuba said to be working in more than 40 countries.” Economic Eye on Cuba (16-22 February 1998). 4. In the mid 1980s the government began promoting and in recent years has stepped up what has been labeled “health tourism” (turismo de salud), which has attracted many foreigners, generating needed foreign currency. In 1995 health tourism reportedly brought in 3,500 tourists and generated hard currency revenues of US$24 million. “One thing Cuba does right,” The Economist (September 7, 1996), p. 42. 24 medical centers in Havana and 12 in the interior are reported to be dedicated to health tourism, developed through agreements with more than 200 travel agencies in more than 60 countries. It appears that the comparatively low cost of good quality care in Cuba with respect to medical centers in North America and Europe, is particularly attractive especially to Latin Americans. The State company SERVIMED was formed as a division of Cubanacán, S. A. to offer “sun and medical attention” to foreigners thru programs which includes medical treatment, airfare and accommodations. Dr. Sergio Beltrán, “Cuba: turismo contra salud,” Boletín del Instituto Cubano de Economistas Independientes, Vol. 1, No. 1 (enero/febrero 1996), pp. 35-36. Cuba is reported to have received 7,000 health tourists in 1996. Eloy Rodríguez, “Por la salud de los turistas,” Granma Internacional (30 de abril de 1997). The State Department cites press reports that these left Cuba US$25 million. “Fact sheet: The Embargo and Healthcare in Cuba: Myth versus Reality,” Bureau of Inter-American Affairs, U.S. Department of State (August 5, 1997). If the 1995 rate of revenue is applied to the 7,000 reported tourists in 1996, Cuba will have generated US$48 million in 1997. The above calculation is assumes gross revenues of $48 million at a net return of 15%, which is much lower than the 32% net return on tourism reported by Cuba for 1996. See Maria C. Werlau, “Foreign Investment: The Limits of Commercial Engagement,” Cuba in Transition—Volume 6 (Washington: Association for the Study of the Cuban Economy, 1996), p. 482, for an explanation on net earnings for tourism. 5. Cuba exported US$125 million in medical products in 1996. Directorate of Intelligence, CIA, Cuba: Handbook of Trade Statistics, 1996 (Washington, November 1996). 6. 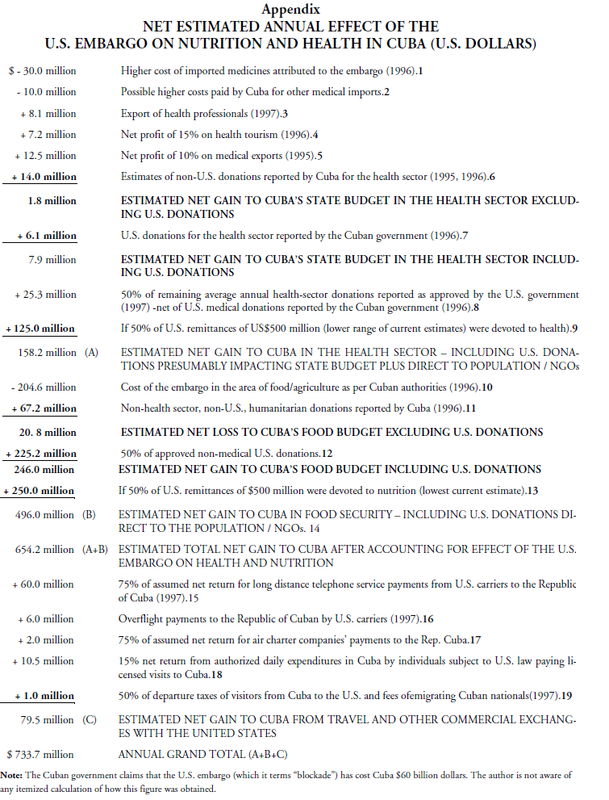 The American Association for World Health report cites Cuban government sources indicating that $20 million in donations went to the health sector in 1995. See American Association for World Health, Denial of Food and Medicine: The Impact of the U.S. Embargo on Health and Nutrition in Cuba (Washington, March 1997), p. 287. This calculation takes medical donations reported by Cuba minus reported U.S. donations in the health sector of US$6,097,088. “Donativos recibidos por Cuba provenientes de Estados Unidos como ayuda al desarrollo y humanitaria en 1996,” undated, Faxed by Cuban Interest Section in Washington, D.C., First quarter 1998. 8. The U.S. Department of State reported in August 1997 that $227 million were approved in humanitarian donations of medicines and medical supplies over the last four years. “Fact Sheet,” op. cit. For the purposes of the above calculation, a yearly average of $56.75 million was used, from which the Cuban government’s reported 1996 figure for medical donations ($6.1 million) was subtracted. For the purpose of erring on the side of caution, only 50% of U.S. donations reported as approved are presumed to reach Cuba. 9. Remittances to Cuba have been estimated as follows: For 1997 the U.S. Cuba Trade and Economic Council cites a total of $575 million -$275 million in remittances from individuals subject to U.S. law (from 1.5 million individuals or 375 thousand families of Cuban descent) plus $300 million from outside the U.S. Economic Eye on Cuba (5-11 January 1998). 10. The AAWH report cites a cost to Cuba of $204.6 million just in food and agriculture-related imports. Denial of Food and Medicine, p. 129. 11. This calculation takes into account total donations reported by Cuba of $87,535,152, less total U.S. donations of $6,340,562 (“Donativos recibidos,” op. cit.) minus non-U.S. donations for the health sector of $14 million, as reported above (see note 4, above). 12. A total of US$2,148,524,744 was approved from 10/23/92 to 7/31/97 by the U.S. government for donations to Cuba in the following categories: gift parcels, clothes, food/agriculture, education, shelter and misc. For the reported period 4.7 years, the annual average is US$450.4 million. “Humanitarian Donations to Cuba Approved by the Dept. of Commerce, Bureau of Export Administration, after the passage of the Cuban Democracy Act: 10/23/92 – 7/31/97,” Table dated August 4, 1997, provided by the U.S. Department of State, Office of Cuban Affairs. 13. See note 9, above. 14. Total estimated donations for food, as per above conservative figures, equal $542.4 million, equivalent to 90.4% of Cuba’s total expenditures on imported food of $600 million in 1996. As per figures cited by Cuba’s Minister of the Economy, Economic Eye on Cuba (17-23 February 1997). 15. Companies providing the payments are ATT, WilTel, global One, MCI, IDB Worldcom, ATT Puerto Rico, Sprint and Telefónica Larga Distancia de Puerto Rico. Economic Eye on Cuba (5-11 January 1998). 17. Approximately 48,653 passengers traveled in air charter flights to Cuba in 1997. Ibid. 18. The U.S. Treasury Department authorizes up to $100 to be spent in Cuba by individuals subject to U.S., although it is estimated they spend an average of $150 to $200 daily. The average visit is 10 days. Estimated travel Visa payments in Cuba were $3.5 million form 70,000 individuals subject to U.S. law. U.S. visitors were estimated to have imported into the U.S. $7.5 million -the estimated $100 quota for personal use of authorized products from Cuba. Ibid. 1. American Association for World Health, Denial of Food and Medicine: The Impact of the U.S. Embargo on Health and Nutrition in Cuba (Washington: AAWH, 1997). 2. Castro, on a late July 1998 visit to Jamaica. Michelle Faul, “Castro reconciles with Jamaican foe,” Associated Press, Montego Bay (July 31, 1998) in CubaNet News (July 31, 1998). 3. Castro in Geneva, speaking before an assembly of the World Health Organization. “Castro says U.S. followed “genocide” policy on Cuba,” Reuters, Geneva (May 14, 1998) in CubaNet News (May 14, 1998). 4. The Arca Foundation, The General Services Foundation, the Christopher Reynolds Foundation and the John D. and Catherine T. MacArthur Foundation. 6. For this reason, I have chosen to withhold making specific references to the work of academics currently employed in Cuba. 7. The Castro regime has been calculated to have received an estimated $100 to $150 billion in aid from the Soviet bloc over three decades—up to $6.7 billion a year during the last years of Soviet Communism, plus another $1.2 billion or more a year in military assistance. Adolfo Leyva, Propaganda and Reality: A Look at the U.S. Embargo and Castro’s Cuba (Miami: The Endowment for Cuban American Studies of the Cuban American National Foundation, July 1994). 8. In fact, external financing currently is reported by Minister of the Economy José Luis Rodríguez to total about US$500 million in medium and long-term credits and approximately US$2 billion in short term credits at 14 to 22%. In addition, the Minister reports Cuba requires between US$2-3 billion in low interest, medium-term, credits to implement and sustain a recovery strategy. As a result of Cuba’s inability to obtain external financing, “purchases were being made on a day-to-day and week-to-week basis, limiting the ability to take full advantage of volume discounts and lower international commodity prices” Economic Eye on Cuba (15-21 June 1998). This publication reports that foreign companies continue to report increases in delays of payments for products and services sold to Republic of Cuba companies. It should be noted that in 1997 private financing to emerging markets (bond and equity issues and loans) totaled $319.8 billion, according to International Monetary Fund, Global Repercussions of the Asian Crisis and Other Issues (Washington, 1998), p. 42. 9. A total of 92,909 kilograms in active pharmaceutical ingredients imported from Europe was quoted to have been $786,000 higher (40%) than the price Cuba would have had to pay the company in Miami (US$1.96 million). See table on page 112 of the AAPH report. 10. Most drugs must be prescribed by specialists; family doctors can only prescribe a limited scope of analgesic, antibiotics and vitamins. But specialists only see patients at local clinics (“consultorios”) once or twice a month, so a family doctor must examine the patient and refer him/her to a specialist, after which certification must be obtained for that purpose. A six-month wait is common to see a specialist at a specialized clinic (“Policlínico de Especialidades”). If a specialist finally prescribes a medicine, if the medication belongs to a certain group, a certificate must be issued describing the pathology, dose, duration of treatment as well as information on the patient. This document must be signed by the specialist, the head of the department and the Director of the Policlinic before the patient can go the pharmacy to fill the prescription. Oftentimes, if the information on the certificate is not to the full satisfaction of the pharmacist, the medicine is not dispensed and the error or omission must be corrected in the certification. If the pharmacy does not have it, a long and complicated process begins to request it. If a family doctor prescribes a medicine between 8AM and 4PM and the pharmacy only has that medicine for emergency room patients, after 4PM, the prescription must be re-issued. Furthermore, pharmacies are supplied once or twice a month in small quantities, and because each pharmacy is assigned to a certain area and hospital, pharmacies only accept prescriptions from doctors assigned to that jurisdiction. So patients’ illnesses must match the pharmacy’s particular supply. Many cases of high blood pressure or psychiatric disorders are thrown into crisis due to the impossibility of obtaining the required medication. Described in Emily Rodríguez, “Métodos y mecansimo de distribución de los medicamentos en Cuba,” Agencia de Prensa Libre Oriental (APLO), January 12, 1998 in CubaNet News. 11. Jesús Hernández Cuellar, “Castro exporta medicinas, pese a la escasez en Cuba,” Contacto (Abril 7, 1998) in CubaNet News (April 7, 1998). 12. Michael Ranneberger, Coordinator, Office of Cuban Affairs, U.S. Department of State, presentation at conference “U.S. Policy on the Supply of Food and Medicine to Cuba,” Capitol Hill, Washington, D.C., April 15, 1998. Roger Noriega, senior staff member for Senator Jesse Helms (R-NC), related a similar account to the author in early 1998. Mr. Noriega went on an official visit to Cuba during the Pope’s trip to the island in January 1998 and toured health facilities. 13. The author met with Joan Roberts, Director, and John Bolstein, Cuba Officer, on March 30, 1998 at the Department of Commerce in Washington, D.C. They manage licensing for Cuba from the Foreign Policy Division, Office of Strategic Trade and Foreign Policy Controls, one of five departments of the Bureau of Export Administration. 14. Personally related by Roger Noriega, senior staff member for Senator Jesse Helms, April 1998. 15. For example that in 1989 57% of the proteins and 50% of the calories came from imported foodstuffs. Report, p. 121. 16. U.S. law passed in October of 1992 (also known as the Torricelli Law). Among its provisions, it abolished subsidiary trade with Cuba and prohibited ships from docking in U.S. ports for 180 days after docking in Cuba. 17. “Fact sheet: The Embargo and Healthcare in Cuba: Myth versus reality,” Bureau of Inter-American Affairs, U.S. Department of State (August 5, 1997). 18. The tables are not included here because of space considerations. They are available from the author. Many of them originate from Manuel Sánchez Herrero and Arnaldo Ramos Lauzurique, “El sector agropecuario cubano bajo el socialismo de estado,” in this volume. Ed. 19. “Cuba donará 100.00 dólares para damnificados por tifón Linda,” EFE/Hanoi (18 November 1997) in CubaNet News (November 11, 1998). 20. Larry Rohter, “Cool to U.S., Caribbean hails Castro all the more warmly,” The New York Times (August 2, 1997). 21. It is said that at the urging of the Cuban government, Cuban specialists were sent to Chile to evaluate and treat the young son of center-right Congressman Andrés Allamand, of the Partido Renovación Nacional. The child and members of his family were subsequently flown to Cuba, where he was treated for some time, returning to Chile with a staff of dedicated Cuban medical personnel to continue treatment. Allegedly, most if not all, of the expenses related to this case were covered by the Cuban government. This account was related to the author by several close friends of the Allamand family. 22. For more on this see remarks by María C. Werlau at a conference “U.S. Policy on the Supply of Food and Medicine to Cuba: What is the appropriate U.S. response?, sponsored by The Georgetown University Caribbean Project, Capitol Hill, Washington, D.C., April 15, 1998. Maria Werlau is an international consultant and independent scholar based in northern New Jersey and Co-founder/Executive Director of the non-profit “Cuba Archive” project.